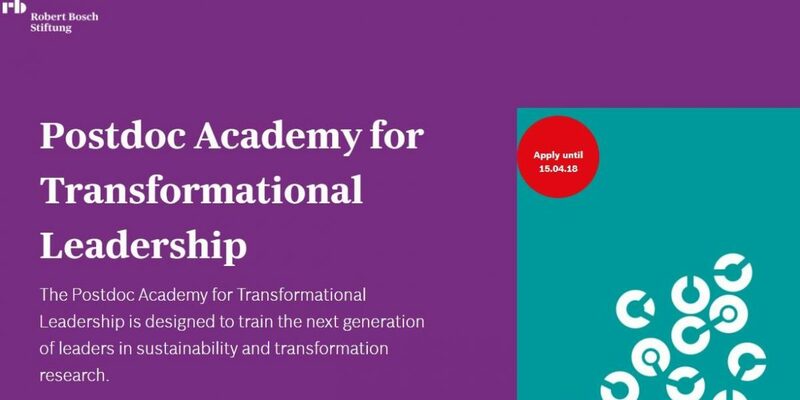 For the Postdoc Academy for Transformational Leadership, the Robert Bosch Stiftung collaborates with four leading academic research centers to unite expert knowledge and educate the next generation of leading sustainability and transformation scholars. The program aims at postdocs from across Europe who want to make an impact on the transformation towards a sustainable society and advance the complementarity of natural science, social sciences and the humanities by means of their research. 4th seminar from 17th to 19th March 2021 at the Dutch Research Institute for Transitions (DRIFT) in Rotterdam/ The Netherlands. The Postdoc Academy for Transformational Leadership provides an intensive high-end training with four seminars in two years that broaden inter- and transdisciplinary research competencies of early career sustainability researchers and to promote their qualifications towards transdisciplinary leadership. The program also offers seed funding (e.g. for stakeholder meetings or proposal writing activities) to small groups of participants, who plan to initiate research collaborations. Applications can be submitted on the online application platform of the Robert Bosch Stiftung here.